Whether you want this Windows CE shareware for personal or business use, the speed, convenience and flexibility of ACDSee Mobile for Windows CE will make it one of your favorite Pocket PC applications. 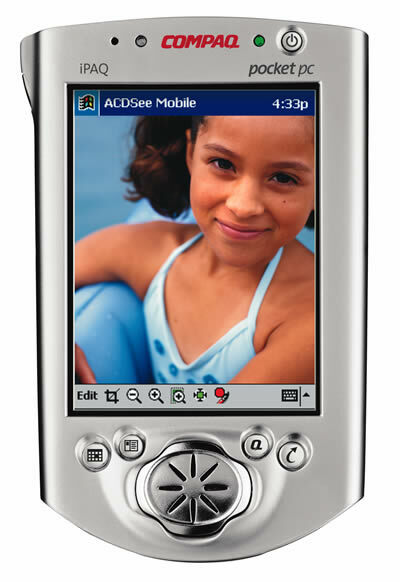 ACDSee Mobile is Windows CE shareware that lets you to carry your favorite digital photos on your Pocket PC device. You can also use this Pocket PC image viewer to beam your images to other PDA users that have ACDSee Mobile for Windows CE software. ...... This text and sound data can be viewed with ACDSee Mobile on your Pocket PC, or transferred to your desktop PC and viewed with a digital imaging application such as ACDSee. Qweas is providing links to ACDSee Mobile for Windows CE 1.0 as a courtesy, and makes no representations regarding ACDSee Mobile for Windows CE or any other applications or any information related thereto. Any questions, complaints or claims regarding this application ACDSee Mobile for Windows CE 1.0 must be directed to the appropriate software vendor. You may click the publisher link of ACDSee Mobile for Windows CE on the top of this page to get more details about the vendor.